The first C-47’s converted as “Gunships” flew in Dec. 1964 in Vietnam and their controversial start showed instantly tremendous successes in the close air support, often required in the Vietnamese Jungle combat scene where the Viet Cong (VC) could hide and stage ambushes at choice. The WWII and Korea Veteran C-47’s were provided with 3 laterally mounted rapid firing guns that were simply placed on the port side of the aircraft’s cargo floor. The captain banked the plane and started a narrow orbit, circling in a pylon turn overhead where VC presence was detected by US ground troops. The firing action was triggered by the captain who used the port Prop hub and wingtip for aiming, while the tracers gave visual sight of tracers and hits in the target area below. The GE mini guns with electrically driven 6 revolving barrels of the Gatling Gun type, pumped out 3000-6000 rounds per minute! The effect of such hefty “ammo hailstorm” was similar to that of a giant aerial shotgun, used in a combat scene where there was no virtual cover of armor plating or concrete bunkers. The perforation of any object in the shooting range was obvious and lethal for most VC soldiers. While the much faster Jet fighters and Skyraiders made strafing runs with forward firing ammo, the enemy could quickly regroup or run away as the attack plane flew overhead and stopped its firing, But the AC-47 ( Attack/ Cargo) could give a semi permanent firing action, with intermittent shooting while loitering for hours over the same small area and pinning down the opposing forces. At night, flares were thrown out for illuminating the enemy positions and with all light trails form the tracers, the aircraft had the looks of a raging fire spitting Dragon, hence the nicknames Puff the Magic Dragon and Spooky became later the universal name/ logo for this old Soldier, built 20 years earlier and never designed for an active combat role. 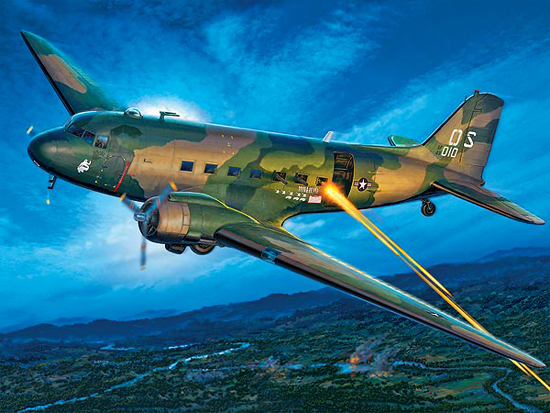 The AC-47 soon got a reputation for its helpful close air support for the US troops that encountered often surprise attacks of large numbers of VC guerrillas hidden in nearby bushes, hammocks or fields. The guns mounted in the AC-47’s as seen on photo 2 are the GE Mini guns GAU-2/A of 7.62 mm caliber, but also other types of Machine guns were used of bigger caliber. 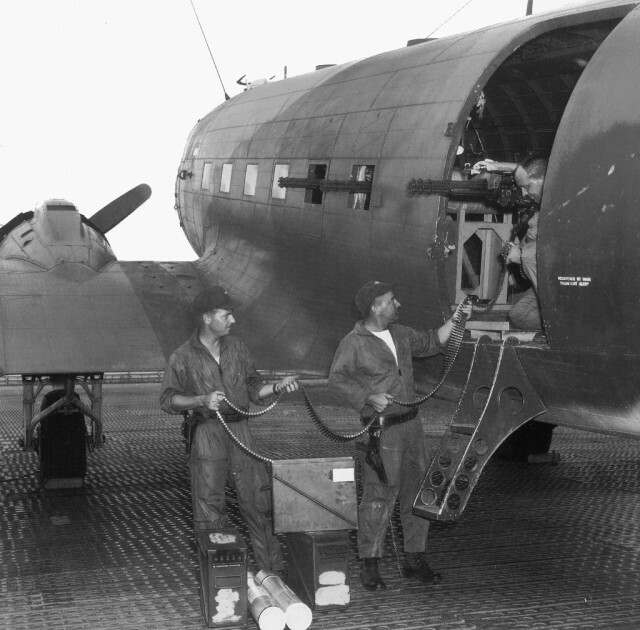 With the success of the AC-47, the US went in search of larger aircraft as a weapons platform with the same laterally shooting techniques. Best known are the AC-119G, a converted Fairchild “Flying Boxcar” (named Shadow and Stinger) and the Lockheed Hercules AC-130 named Spectre, a flying monster gunship with hefty Cannons, Machine guns, Radar jamming devices, Infrared detectors, flare boxes etc. But the AC-47 was the first one in use. It had a 7 men crew and carried up to 24.000 rounds on board, The airplane could take a payload of over 2.5 tons of ammo and quickly recharge at a nearby airport. Under the name Spooky the aircraft grew to a legend, while it was only for 5 years in operations in Vietnam. In Dec.1969, the last AC-47 flew its mission and made such reputation that VC soldiers were ordered not to shoot at the overhead flying Spooky, as their small rifle fire would expose the position of the enemy troops to the aircraft crew and that would soon turn out to become an invitation for a free one-way ticket to Hell. Allegedly, the US have flown 150.000 combat missions in those Vietnam years and pumped out nearly 100 million rounds of 7.62 mm!!! Correct or not, this shows that the concept of the side ward firing guns shot in an inverted cone to the ground surely had its benefits for supporting the troops below. Contrary to popular belief, the AC-47 operations did not end with the Vietnam conflict. The plane as a Gunship ‘soldiered’ on for many more years, up until 2015.